One of Ucommune's workshops in Beijing. PHOTO: Credit to Ucommune. 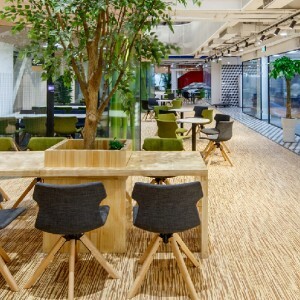 Ucommune (优客工场), the WeWork of China that provides shared workspace for startups, has been listed in the defaulter list by the Beijing Daxing People’s Court on 18 January 2019, according to Tianyancha, an online enterprise information revealing platform. The court didn’t provide details of the dispute. The company responded on 23 Jan that the legal dispute happened in 2017, and the company paid all of the dues of CNY 2,905 (USD 427) to the court’s enforcement bank account. The search result of China's Enforcement Information Disclosure Website, operated by the Supreme People’s Court of China, shows that Ucommune has been removed from the defaulter list. Ucommune was founded in 2015 as a start-ups co-working space provider and entrepreneurs’ community. The company provides shared workspaces and relative services to technology startups, freelancers, small businesses and some large enterprises. The company raised USD 200 million in its newest Series D round of financing led by All-Stars Investment and CEC Capital, valuing it at USD 3 billion. It has closed 14 rounds of funding in the past 3 years according to Itjuzi, the CrunchBase of China. Ucommune has started informally negotiating with officers of the Hong Kong Stock Exchange about the company’s initial public offerings on the HKEX, according to Mao Daqing (毛大庆), the founder and board chairman of the company. It is widely believed that Ucommune will go public in the first half of 2019. Ucommune offers co-working space solutions to small-to-medium enterprises.